The following movie tells the story of Ahlam from Jordan. 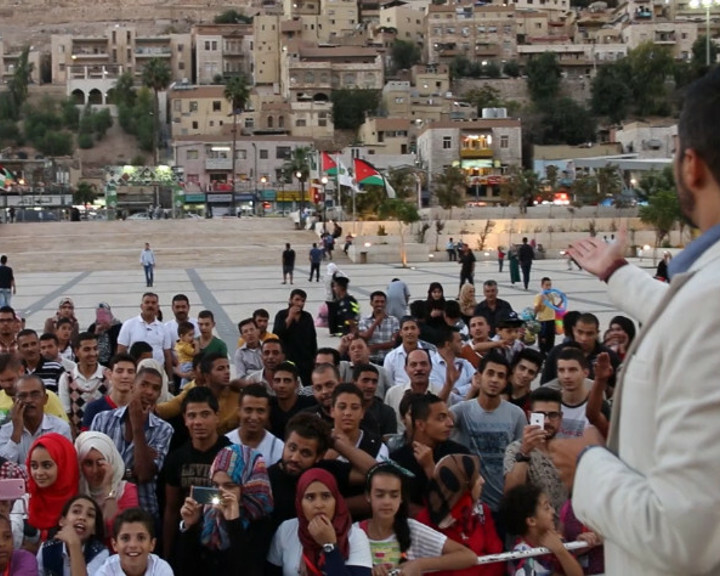 The performance was developed during the Equal in the streets workshop in Jordan and was performed at Hashemite Plaza in Amman in Jordan in 2014. Ahlam is a girl who lives in Jordan and is suffering from gender inequality. Her father prevents her from going outside, even if she wants to visit a female friend for study purposes. On the other hand he allows her brother to go wherever he wants. Ahlam is married to a man who has the same believes like her father. Her husband doesn’t respect her, and he believes that the only role for woman in life is to stay at home to take care of the children and to do domestic work. Ahlam is dreaming everyday: What might happen if the roles of men and women change ? In the performance, “Streetshow band” a group performs the actual life and dream of Ahlam. The performance is also based on the interaction with the audience. They get asked how the shown conflict can be solved and contribute ideas.